Use a mac? You’ll want to grab Alfred App. I’m finding it an invaluable replacement for spotlight and the workflows allow me to supercharge my workflows. It’s so useful that I’ve purchased the Powerpack lifetime license. I use it as an activity monitor for CPU usage, and from there I can easily force quit any process if needed. It’s easier to see all processes on the Alfred UI instead of opening Activity Monitor on your mac. There’s also the workflow Kill Application – by Sebastian Hallum Clarke (and also on his site you can find other cool workflows). I use this one a lot. It’s super simple and by writing “Timer” and the number of minutes, you can easily set a reminder. It’s great for anyone using the Pomodoro technique or even if you leave something on the stove and want to go back to work. This one saves me time when I need to deploy my SSH key on a new server. Type ‘pk [ssh key file name]’ and it’ll copy the ssh key to the clipboard. I find myself using this when I need to test a page and bypass the cache. Type ‘incog [url]’ and it’ll launch a new chrome window in incognito mode. Finds a folder by name. I find this is faster than spotlight in just about every search. List all the Smart Folders/Saved Searches (same thing) on your system and drill down into their contents. Works in much the same way as Alfred’s File Filter, but Smart Folders are also available outside Alfred and are a bit more flexible. For example, you can configure a Smart Folder to show all video/audio/image files without having to specify each different filetype individually. If you already use Smart Folders, this workflow can save you the work of re-implementing them as File Filters. What’s more, you can exclude specific filetypes with a Smart Folder, which Alfred cannot do. If you use stackoverflow as much as I do, this is a must-have. I find myself needing to calculate differences between dates in my personal life a lot lately. This workflow saves me a lot of time to do that. Want to know how far Christmas is away in days? ‘dcalc 12-25-16 – now d’ returns the number of days (assuming you’re using the US short format like I am). All my Macbooks periodically have issues with wifi. I’ve never been able to figure out what’s causing it but I use Wifi Control to restart the wifi which allows me to connect successfully. If you use bugmenot at all, this is a useful extension to get logins without loading a new tab. Type ‘bn domain.com’ and you’ll get a list of matching passwords to use. I just spent the past two days complaining about Windows 8 to everyone I know because of how awful the experience is. I installed Windows updates, rebooted, and the system stops working. It turns out it wasn’t Windows causing the problem but ESET AntiTheft on Dell laptops. It turns out there’s a permission bug specific to Dell machines when ESET creates it’s ghost account and instead of giving it restricted access, the system essentially copies the permissions and then changes everything on the C: drive to a state where the permissions are no longer accessible. Unfortunately, the only known fix at this point is to contact ESET support. I called their support line in North America and the tech knew about the issue right away. You’ll have to reboot into safe mode, and then get them to remote in to install a utility that runs a script that resets the permissions. The tech assured me they are working with Dell to get this issue resolved so until they do, make sure you don’t activate ESET’s AntiTheft on the Dell machine. A few years ago, I started at a company as a help desk tech. After establishing myself, I’d often get put on all the…interesting issues. When nobody else could figure out the problem, I’d get called in to figure out the issue. During my early days as a new tech there, the manager of the team passed me a ticket and stopped by to give me background on the situation. This particular client would call in every week because one computer couldn’t talk to the server and at one point, every tech on the team had worked on the problem and nobody had been able to figure it out. My manager told me not to stress about it because it was definitely something on their side but he treats the situation as a rite of passage for all new hires. I give the doctor a call back and he gets me connected to his PC and begins to elaborate on the problem and all the things everyone has had him do. He explains how his tech knows the problem is with our software since everything on the network side works. He clicks on the Windows XP start menu and by sheer luck, the tech had set the menu back to classic which meant the banner along the left showed which version of Windows was running. As the doctor continued on with his explanation, I noticed the banner on the start menu said “Windows XP Home Edition”. I politely interrupted the doctor and informed him that I had figured out the problem. He went quiet for a few seconds and said “You haven’t done anything yet and I haven’t finished explaining everything. How could you possibly have figured out the problem?” I informed him that he’s running Windows XP Home Edition which doesn’t support business networking and explains why he couldn’t connect to the server. He insisted that all his computers are running Windows XP Pro and besides, how could I possibly know that without having even done anything? I asked him to click on the start menu and then he went quiet. I asked if he was there and he apologized and said he was going to call his tech to get the OS fixed. He asked if it would be alright for him to call and request my help if there are any problems from there. I closed the ticket with “Problem solved. Issue was Microsoft Windows XP Home Edition”. If you’re a power user like me, you’ll find Firefox will often balloon to about 1 gig of RAM usage after some time. Often times it’ll hit that point and then just crash. I’m probably in the minority but my surfing habits tend to be open a mess of tabs and then come back and read later. I never go back to bookmarks (even though I do have a delicious account and actually tag stuff). At any time, I may 25-100 tabs open in my browser. I’ve had to install add-ons like session manager just to ensure I don’t lose my tabs when working because Firefox’s built-in tools wouldn’t restore my tab session when it crashed. 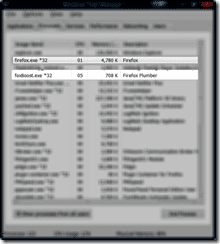 I recently stumbled upon Firefox Plumber (http://www.rizone3.com/2011/firefox-plumber/). I’ve been testing it for a few days now and I have to say I’m completely blown away by how well the utility works. Currently I have 32 tabs open in Firefox. Under normal loads, the browser would utilize between 800MB-1GB of memory. 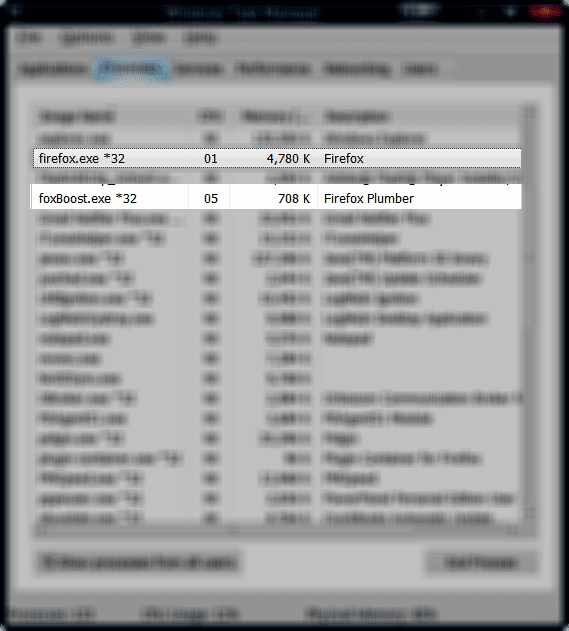 With Firefox Plumber running, which is only utilizing about 708k in memory usage, Firefox is currently fluctuating between 4 and 7 MB of memory usage. The only caveat is that Firefox Plumber does utilize about ~5% of the CPU to keep Firefox tamed. After some sleuthing, I found it accomplishes this by offloading the memory to the swap file which could present it’s own issues. I’m going to stick with it for now since Firefox appears to be more stable and see how things work.